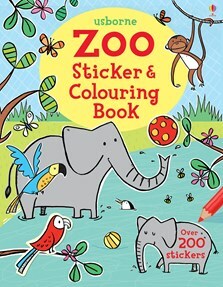 Lions, tigers, elephants, penguins and lots of other animals feature in this fun colouring and sticker book for little children. The first half of the book is full of popular zoo scenes such as the big cat enclosure, the aquarium and the tropical birds’ rainforest, with over 200 colourful animal stickers for children to add in. The second half of the book features lions, monkeys, giraffes, elephants and more to colour. The backgrounds are already completed so children can focus on the fun details. A great way to introduce children to less familiar animals or to remember a recent trip to the zoo.